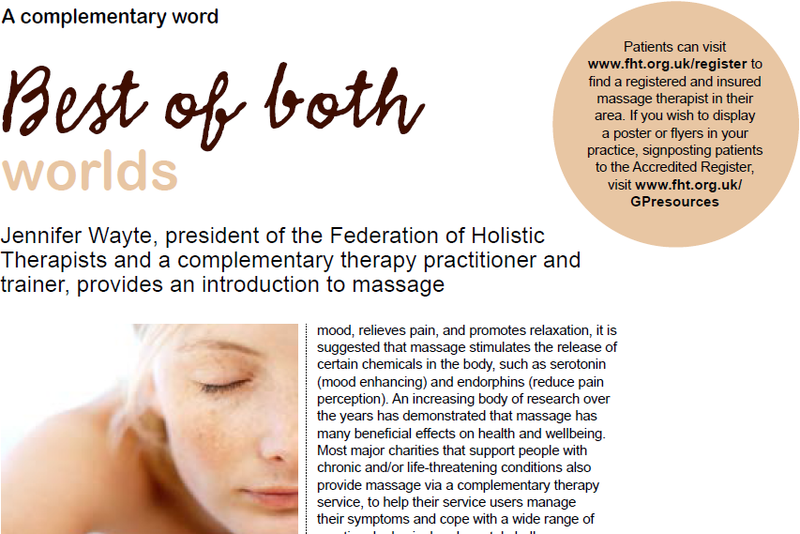 Jennifer Wayte, President of FHT, has contributed to a massage article published in the June issue of Practice Management – a magazine distributed to more than 4,000 GP practice managers in the UK – in which readers are pointed to the FHT’s Accredited Register if looking for a therapist. Practice managers play a vital role within GP surgeries – as well as being responsible for managing staff and budgets, they develop the practice’s business strategy, which can include signposting doctors and patients to additional health and social care services. Posted on 15 June, 2015 by Federation of Holistic Therapists (FHT). This entry was posted in news and tagged news. Bookmark the permalink.